OXFORD, Miss. – After earning a 12-0 midweek win over Memphis, and improving to a school record-tying start of 26-4 (6-3 in SEC) in its first 30 games, the No. 3 Ole Miss Rebels pay a visit to Starkville to face Mississippi State this weekend. Due to predicted inclement weather, Ole Miss and State will not play Friday night and will, instead, play a doubleheader on Saturday, beginning at noon. Sunday’s game will begin at 1:00 p.m..
Ole Miss enters the series ranked No. 3 in D1Baseball, USA Today Coaches, NCBWA, and Baseball America and No. 5 in Collegiate Baseball. The Bulldogs are not ranked in any major poll. On Monday, Ole Miss’ Parker Caracci and Tyler Keenan received SEC Pitcher of the Week and Co-Freshman of the Week Awards, respectively. Last week, Caracci made three appearances for the Rebels resulting in three saves. He threw 1 ⅔ innings on Tuesday vs. then-No. 14 Southern Miss; two full innings Thursday night against Arkansas, where he struck out the Hogs’ side in the 9th inning; and another 1 and ⅔ of scoreless baseball against Arkansas on Saturday to save both the game and the series for Ole Miss. For the week, Keenan went 7 for 12, including four RBIs and a huge three-run homer in the 7th inning of the deciding game vs. the Razorbacks. Earlier this season, Ryan Rolison was named SEC Pitcher of the Week for his week one performance, and team co-captain Brady Feigl was named NCBWA Player of the Month for February. The Bulldogs (15-15, 2-7 SEC) dropped the series to LSU in Baton Rouge in week three. State was swept at home by Vanderbilt in week one of league play, and lost the week two series at Missouri, 2-1. Bulldogs’ head coach Andy Cannizaro resigned abruptly on February 20, and Gary Henderson, former head coach at Kentucky, took over as interim head coach. Last season, the Bulldogs (40-27, 17-13 SEC) won the Hattiesburg Regional, before losing the Super Regional in Baton Rouge, 2-0. Last March, Ole Miss hosted the Bulldogs and dropped three close games— two by a single run and the other by only two runs. In game one, Ole Miss jumped out to a three-run lead, only to see State score four in the late innings to win the first game of the series. In that game, pitcher James McArthur started and went 6 ⅔ innings. Thomas Dillard hit a double and Tate Blackman stroked a triple. 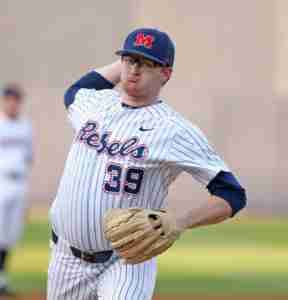 The Rebels dropped game two, 5-3, with starter David Parkinson collecting the loss for Ole Miss. Offensively, center fielder Ryan Olenek hit two doubles. Game three was another tight one with the Rebels coming up short for the third day in row. Then-freshman Ryan Rolison went six strong innings, allowing only two runs. 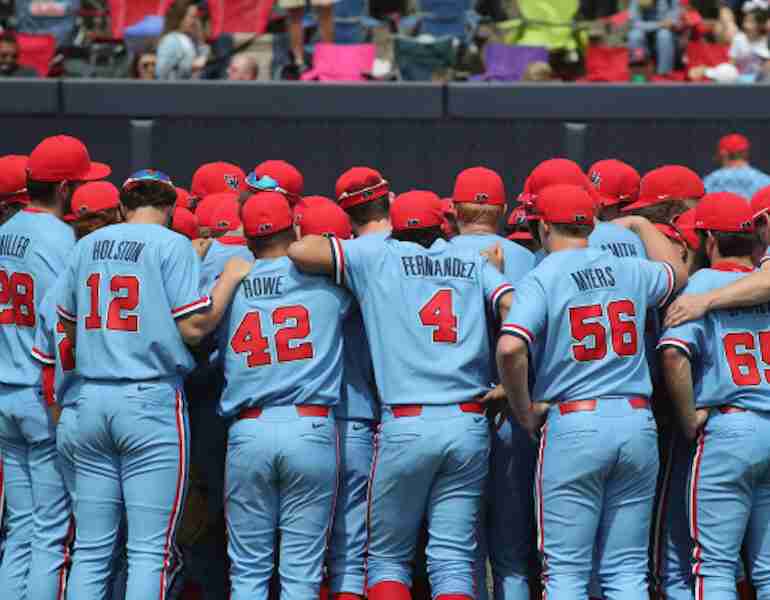 Unfortunately, Ole Miss managed just four hits in the game and left the bases loaded in the ninth inning when State’s first baseman robbed Tim Rowe of a game-tying hit down the first base line. Thomas Dillard had a 15-game hitting streak snapped against Arkansas. Ryan Olenek is currently tied for third in active SEC hitting streaks at 7. In the outfield, look for Elijah MacNamee or Rowdey Jordan at left, Jake Mangum in center, and Tanner Poole or Hunter Vansau in right. In the infield, expect Josh Hatcher or Tanner Allen at first; Hunter Stovall at second; Luke Alexander at shortstop; and either Jordan Westburg or Justin Foscue at third. The catching duties will be handled by Marshall Gilbert or Dustin Skelton. Ole Miss head Coach Mike Bianco announced a change in the Rebels’ pitching rotation Monday, with Ryan Rolison and Brady Feigl switching starting duties. Feigl will now be the starter in game one of the series, with Rolison starting in game two. Brady Feigl will start game one. Ole Miss: Brady Fiegl – (6-1) Brady is tied for SEC lead and 2nd nationally in wins. He sports a 2.23 ERA, which ranks him 7th in the SEC. Ole Miss: Ryan Rolison – (3-3) Ryan, who has a 3.63 ERA, will start the second game of the series against State. The game will begin 45 minutes after the conclusion of game one. 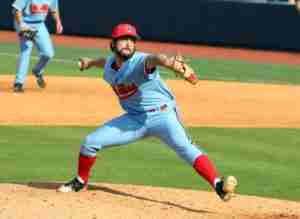 Ole Miss: James McArthur – James (4-0) brings a 2.38 ERA into the third game of the series. His ERA ranks him 10th in the SEC. Mississippi State: Jacob Billingsly (2-2) will take the mound for the Bulldogs in game three. He brings a 3.73 ERA into the game with Ole Miss. In overall batting average, Ole Miss sits 3rd in the SEC at .300, while State is dead last at .256. In runs scored, Ole Miss has notched 216, while the Bulldogs have 139 on the season. The Rebels have hit 35 home runs this season; State has hit a mere 15. Ole Miss also leads the Bulldogs in doubles, 67 to 49. The only positive statistical categories in which State is in the upper half of the conference are: triples, total plate appearances, at bats, and sacrifice bunts. Not surprisingly, the Rebels are toward the top of the stats in most of the pitching categories. 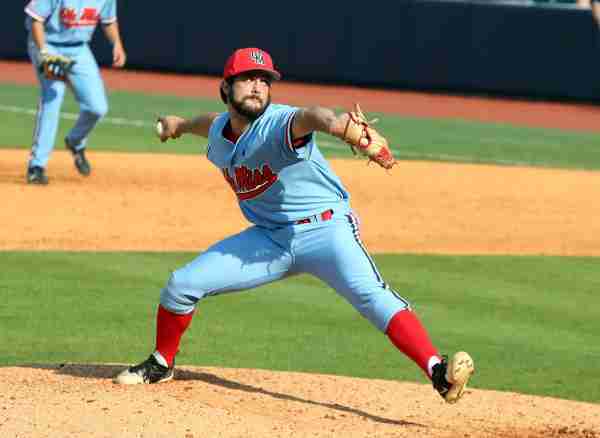 The Ole Miss pitching staff is first in the league in strike-outs (299), saves (14), and wins (26). Rebels’ pitching ranks 4th in the conference in ERA (2.96). Comparatively, State sports a 3.52 ERA, with 296 strike-outs, seven saves, and 15 wins. Ole Miss ranks No. 4 in the SEC in fielding at .983, with 19 errors, while State is No. 11 in the league with 32 errors and a .972 fielding percentage. The Bulldogs have had a rough go of things, beginning with the resignation of their head coach earlier this season and including losses in their first three SEC series. After losing the Egg Bowl to the football Rebels last November, State and its fans would love nothing more than to defeat the high-flying No. 3-ranked Diamond Rebels. However, there is no reason to expect Ole Miss’ success to end in Starkville. State might have a chance of notching a lone victory only because of its home field advantage; however, Ole Miss should take the series, 2-1, if not sweep all three games.